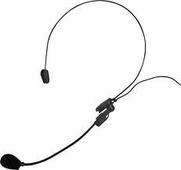 This nearly invisible professional microphone has a superb voice pick-up and frequency range. It goes for the lowest price seen in South Africa, you can save thousands of Rands! Choose a color: black or beige. The mic has a 3.5mm jack plug or mini XLR. Ideal for churches and lecture halls. Clip-on microphone with 3,5 mm jack. Omnidirectional. Solid quality. Neckboom microphone with 3,5 mm jack. Omnidirectional. Solid quality. Excellent sensitivity, with windfoam. For use with the Connector and the Connector Direct.